Ben grew up in a rural area of North Carolina, near Charlotte (though many of the farms here have since been replaced by subdivisions and golf courses). His family frequently went to church in his younger years (largely the result of a believing mother), but only did so consistently after his dad came to know the Lord while in his 40’s. Ben became a believer himself at a church revival (the same night as both his brother and sister!). Sometimes, God just seems to have fun with His plans. Ben went to UNC Charlotte for undergraduate (Earth Science/Biology) and graduate school (Geography). In a strange twist of providence, he actually gets to work in the same field that he studied in college. He is currently employed with Hurt & Proffitt Engineering and does work with streams, wetlands, water quality, protected species, stormwater, and soil erosion. 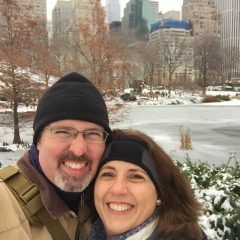 Ben and Mary met at a PCA church in Charlotte, while Mary was in her residency program. They became friends through a multi-church Bible study, started dating, and got married a year later. They have two boys (Carson and Jack) and moved to Virginia about eight years ago. They are thankful for the CTK family, for open and honest relationships here, and for the committed lives of this community of broken (but redeemed) people.